Fortifies pasteurized whole milk with vitamins and organic trace minerals which are typically low in whole milk and are essential to support growth and immune function. Direct-fed microbial specifically developed for use in the neonatal calf to help maintain a balanced microbial gut population. Formulated with yeast cell wall extract that interacts with pathogenic bacteria and supports intestinal health. Low daily inclusion rate (20 g) provides calves with a consistent supply of vital vitamins and minerals. 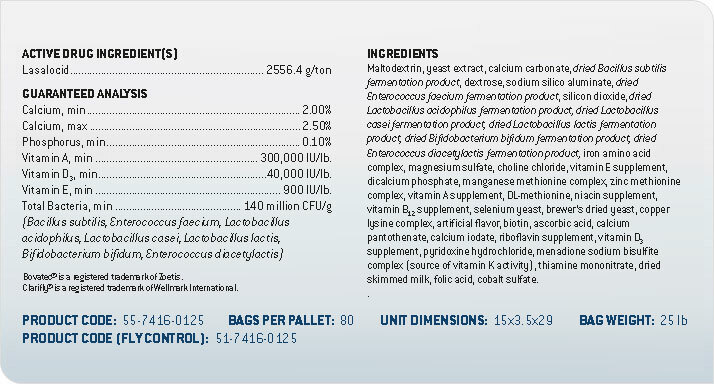 Medicated with Bovatec® for control of coccidiosis. Available with ClariFly® larvicide to prevent the development of house, stable, face and horn flies in the manure of treated calves. Add 10 grams of Whole Milk AddVantage® powder per 2 quarts of pasteurized milk (105-115°F). Feed twice daily at 100-105°F. One scoop (approximately 102 grams) of Whole Milk AddVantage®, mixed with pasteurized milk, supplies 10 calves for one feeding. For accurate feeding, measure scoop weight periodically. Feed to provide each calf 1 mg. of lasalocid per 2.2 lb. (1 kg.) of body weight per day. Hand feed in milk replacer powder. Feeding 20 grams of Whole Milk AddVantage® powder will medicate 124 pounds of bodyweight daily.